In 1835, Holyhead had a workhouse at Black Bridge with Benjamin Griffith as its Governor. Anglesey: Aberffraw, Bodedern, Bodwrog, Ceirchiog, Heneglwys, Holyhead (2), Llanllibio, Llanbeulan, Llanddeusaint (Llanddeusant), Llandrygarn, Llanfachreth, Llanfaelog, Llanfaethly, Llanfair-yn-Neubwll (or Llafir-yn-Eeubwll), Llanfigael, Llanfihangel-yn-Nhowyn (or -Nhywyn, -Howyn), Llanfwrog, Llangwyfan, Llanrhyddlad (or Llanrhuddlad), Llantrisaint (or Llantrisant), Llanynghenedl (or Llanynghenedle), Llechylched, Rhoscolyn, Trewalchmai. The population falling within the union at the 1851 census had been 21,114 with parishes ranging in size from Llanllibio (population 75) to Holyhead itself (8,863). The average poor-rate expenditure for the period 1849-51 had been £5,388 or 5s.1d. per head of the population. Like its parent Anglesey Union, the new Holyhead union initially resisted erected the erection of a workhouse. 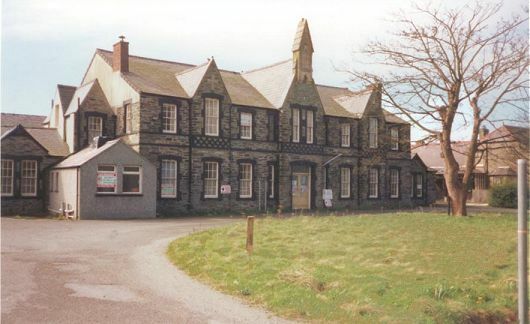 However, the union eventually acceded and in around 1868, a workhouse for 70 inmates was erected at Valley to the east of Holyhead, at a cost of around £2,000. Its location and layout are shown on the 1926 map below by which time it was known as Holyhead Poor Law Institution. 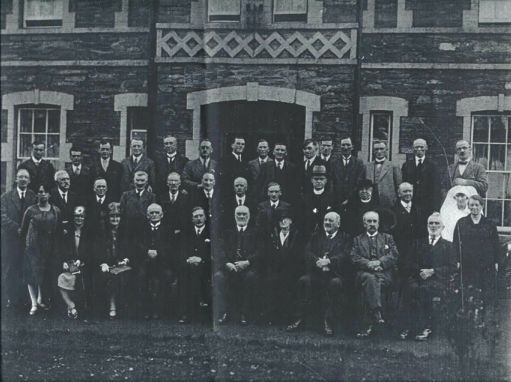 The picture below, date unknown, shows the Board of Guardians and other officials posed in front of the workhouse. The workhouse later became the Valley Hospital. It finally closed in the mid-1990s and the buildings have now been demolished. 1895: Master - Hugh Jones; Matron - Ellen Jones. Anglesey Archives, Industrial Estate Road, Bryn Cefni Industrial Estate, Llangefni, Anglesey LL77 7JA. Holdings include Guardians' minute books (1852-1930); Admissions/discharges (1870-1931); Indoor relief list (1870-1916); Creed register (1899-1906); etc. Thanks to Peter Heseltine for Holyhead pictures.